The actor Onoe Koisaburô I held the name of Onoe Shinshichi I from the 11th lunar month of 1766 to the 10th lunar month of 1796. The actor Onoe Shinshichi II held this name from the 11th lunar month of 1800 to the 6th lunar month of 1818. The actor Ichikawa Omezô III held the name of Onoe Shinshichi III from the 11th lunar month of 1847 to the 4th lunar month of 1856. Dates of birth and death unknown. He started his career as a disciple of the actor Nakamura Tsurusuke II, who gave him the names of Nakamura Fujaku and Nakamura Kagyoku. He joined the Onoe clan, becoming a disciple of Onoe Tamizô II and Onoe Kikugorô V, and taking the name of Onoe Fujaku VI at an unknown date. 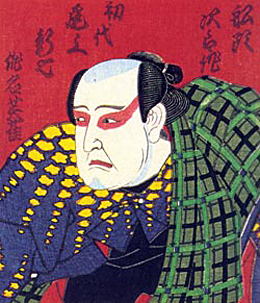 He settled in Tôkyô in the 1st lunar month of 1870 and took the name of Onoe Shinshichi IV in April 1889, playing at the Ichimuraza in the drama "Hanamidô Yamato Bunko". He became a traveling actor and his name disappeared from theater playbills. Born the 25th of January 1898 in Tôkyô. His father was Onoe Daigorô, the personal assistant of the star Onoe Kikugorô VI. 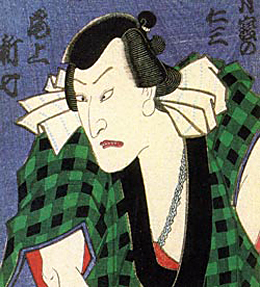 He started his career as a disciple of the actor Ichimura Uzaemon XV, who gave him the name of Bandô Ayame. 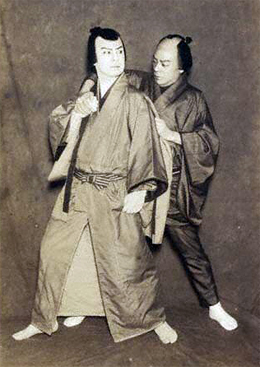 He made his first stage appearance in January 1901, playing at the Miyatoza the role of Chôbê's son Chômatsu in the drama "Manaita no Chôbê". He became disciple of Onoe Kikugorô VI in 1906 and received the name of Onoe Gorô. He took the name of Onoe Shinshichi V in May 1920, playing at the Ichimuraza the role of Fujimatsu in the drama "Otokodate Shibai no Nigiwai". 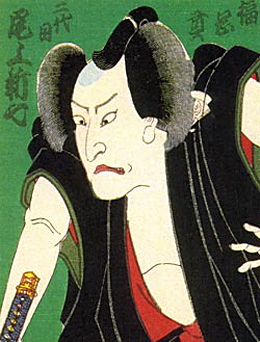 He was a talented supporting actor, who served three generations of heads of the Onoe Clan, being also the disciple of Onoe Baikô VII and Onoe Kikugorô VII. He died the 22nd of March 1980.